This annual lecture celebrates the legacy of Professor Phyllis Rackin, whose pioneering work has insistently asked after the place of women in early modern literature and society, and whose presence at Penn has helped to shape and expand the role of women in the academy. 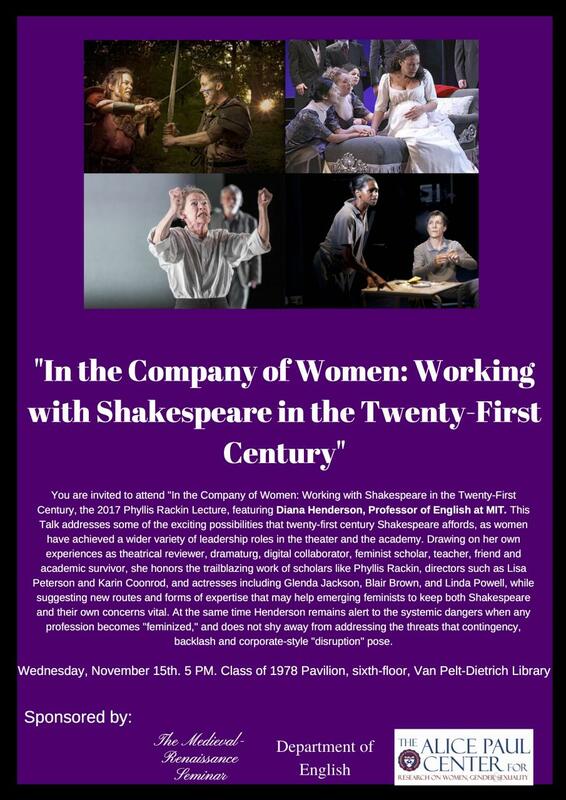 This year's speaker is Diana Henderson, Professor of English at MIT, who will be giving an exciting talk entitled, "In the Company of Women: Working with Shakespeare in the Twenty-First Century." This promises to be an exciting talk that thinks between the early modern and our contemporary moment. There will be a reception following the talk. The author of Collaborations with the Past: Reshaping Shakespeare across Time and Media and Passion Made Public: Elizabethan Lyric, Gender and Performance, Professor Henderson served as Immediate Past President of the Shakespeare Association of America (SAA) from 2014 to 2015 and co-chaired the "Women and Culture in the Early Modern World" seminar at the Mahindra Humanities Center at Harvard University. She has also been an MIT MacVicar Faculty Fellow since 2009 and is co-editor of the prestigious scholarly journal, Shakespeare Studies.